FloodProBE will be in attendance and speaking at the Building Resilience III workshop to be help in New Orleans on March 15-17, 2012. The challenge of living with water is one shared by deltaic communities around the world. Nowhere is this more apparent than in post-Katrina New Orleans and the Gulf Coast region, where people live with a daily awareness of the threat, and opportunities, of water. The series of Building Resilience Workshops I, II and III have been organised with the goals of identifying and fostering the implementation of innovative and sustainable strategies to reduce New Orleans' and South Louisiana's vulnerability to potentially catastrophic hazards, both natural and man-made, particularly those resulting in severe flooding. The 2010 Building Resilience Workshop I addressed a broad range of water- and flood-related issues, with discussions centered on sustainable approaches to rebuilding a culture of resilience in southern Louisiana, spurred by impending climate change. The BRW II in 2011 focused on the role that innovative, sustainable infrastructure can play in mitigating catastrophic disaster, both by reducing the risk of harmful consequences from extreme events and by facilitating rapid recovery. The BRW II brought experts from across the globe to share their research on innovative disaster mitigation approaches and transition methodologies that facilitate implementation. 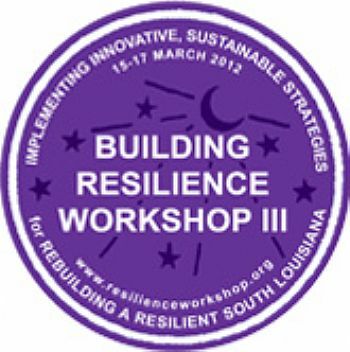 The Building Resilience Workshop III will be held Thursday evening through Saturday afternoon, 15-17 March, 2012. For more information please visit the workshop website at http://resilienceworkshop.org/.